Public spending on education was 3 per cent of GDP in 2012. The Ministry of Education in Singapore is responsible for directing the formulation and implementation of education policies. It has control of the development and administration of Government and Government-aided primary schools, secondary schools, junior colleges, and a centralised institute. By the 1990s, primary education was virtually universal. There are six years of compulsory education starting at the age of six. Primary school comprises six years and secondary four, with two cycles each of two years. Secondary education is streamed at three levels, according to measured ability, leading to junior college or vocational institutions. Some 99 per cent of pupils complete primary school (2008). The school year starts in January. The principal universities are the National University of Singapore (founded in 1905); Nanyang Technological University (1981, as Nanyang Technological Institute); Singapore Management University (2000); Singapore Institute of Technology (2009); and Singapore University of Technology and Design (inaugurated in May 2012). 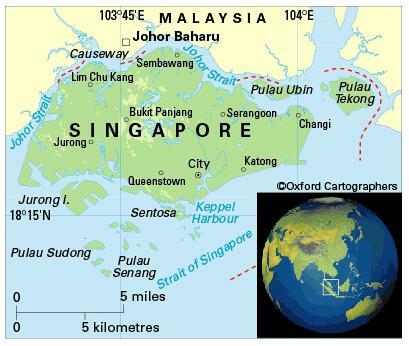 National University of Singapore has 36,000 students from 100 countries; Nanyang Technological University, 33,500; and Singapore Management University, some 7,200. SIM University, a private university founded in 2005, offers academic programmes aimed for working professionals. There are several other private universities, most of which are in partnership with business schools or technology institutes in Europe or the USA.